Though I'm not posting as frequently of late, I did at least manage to start my "best of 2018" list before 2019 actually started, which is better than I did last year (though I may not finish before the year comes to a close). You can read Part 1 here, where we left off in Los Angeles. We'll pick up here back in Miami before bouncing around some more, to the Hudson Valley, the Bay Area, Chicago, British Columbia, and Greece. 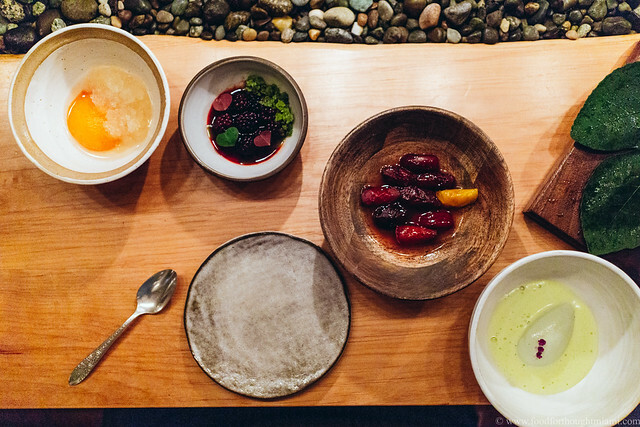 As always, despite the title playing to the traditional year-end trope, there's no pretense here that this list represents the "best" of anything other than a compendium of personal favorites from the past year of dining, listed in roughly chronological order. 2018 was the year the omakase sushi trend came to town. 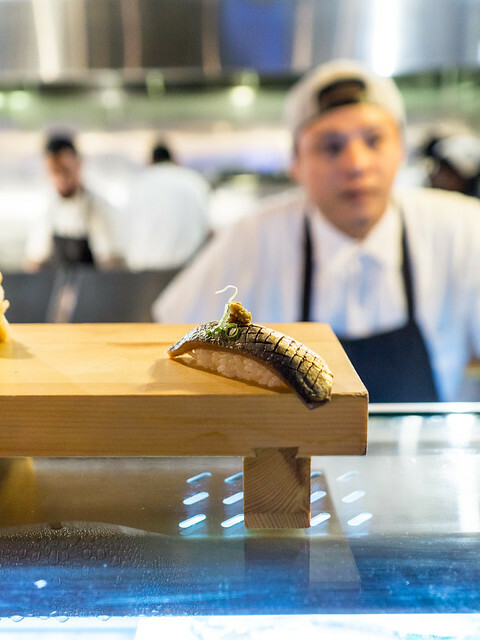 Though Naoe will celebrate a ten year anniversary in a few months, and there have always been a couple other places that will do an omakase if you know how to ask, until this past year Miami had no other dedicated omakase venues. That's changed with the addition of The Den at Azabu, from a group which opened first in Tokyo and then NYC before bringing their talents to South Beach, and Hiden (which is still on my to-do list, and booked for next month). The Den is a private room at Azabu dedicated to omakase sushi service, seating about twelve total. 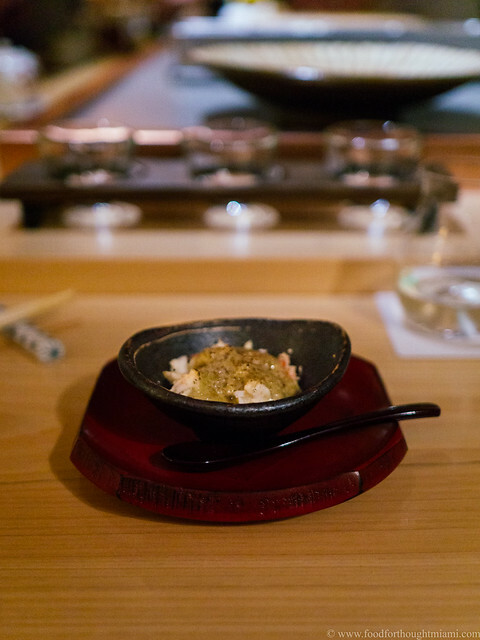 With the minimalist aesthetic, pale wood surfaces, and dining counter surrounding the sushi chefs, it feels very much like the places we visited in Japan. And with a base price starting at $120 for about fourteen courses, it's a relative value. The fish and rice were all of good quality, but the standout item for me was one of the opening dishes which served as precursor to the sushi: tarabagani (king crab), grilled, the meat picked from the shell and served warm in a stone bowl, draped with a blanket of kani miso – crab "miso," which is a nice way of saying the crab's rich, creamy, deeply flavored guts. More college tours with Little Miss F took us close enough to the Hudson Valley to justify a trip to a place I've long wanted to try: Zak Pelaccio's Fish & Game. 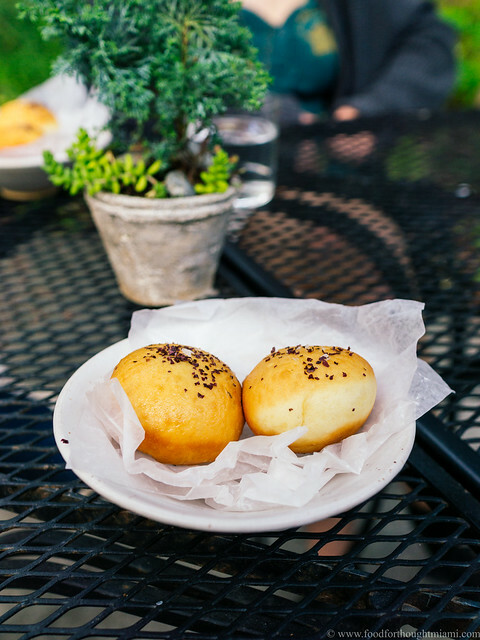 I loved absolutely everything about it – the old brick building, the cozy dining room and bar/lounge area with fireplaces ablaze, Zak and his dog bounding through the restaurant toward the end of lunch service. All of the food was just delicious, including a crab omelet with chili crab sauce that hearkens back to Zak's Fatty Crab days. 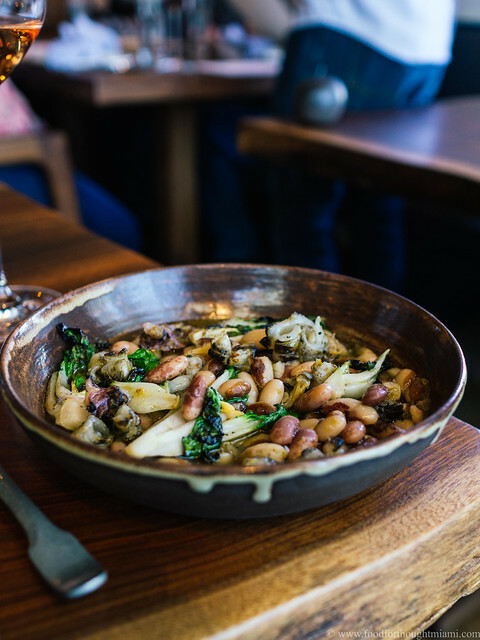 But my favorite was a dish of creamy, meaty beans cooked in the hearth, along with some plump little clams, bits of grilled squid, wispy bok choy leaves, and a hit of sambal. A wonderful dish and a wonderful place. Back home in Miami, it was time for Duck Duck Goose, Chef Jeremiah Bullfrog's avian spin-off from P.I.G. 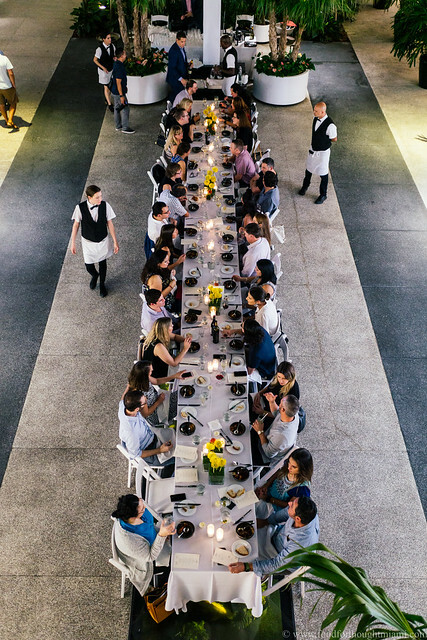 (Pork Is Good), hosted at The Anderson. Jeremiah throws the best food parties in town, and D.D.G. was no exception. Some of South Florida's best chefs served some great dishes – gorgeous duck confit terrines with mushroom gelée from David Coupe and Josue Peña of Faena, Jeremiah's crispy tripe and duck wings with Szechuan chili oil, Itamae's arroz con pato maki, Babe Froman's duck sandwich in the style of a Philly / Italian roast pork sandwich were all standouts. But the best dish of the day – and one of my favorites of the year – came from an out-of-towner, Washington D.C.'s Katsuya Fukushima of Daikaya (and also a Cobaya alumnus, from Experiment #10 way back in 2010). 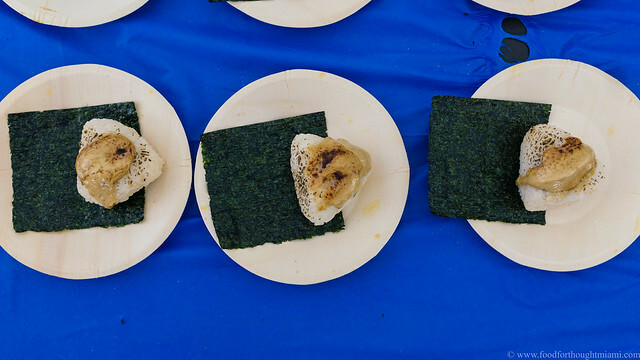 He did these onigiri, stuffed with slow-cooked, miso-seasoned duck, then topped with a torched duck fat miso sauce. Obscenely rich in the best possible way. June found us in the Bay Area for a visit with Frod Jr., where we paid homage to an institution: Chez Panisse. It had been two, possibly three, decades since I'd been. And guess what? It's still genuinely great. 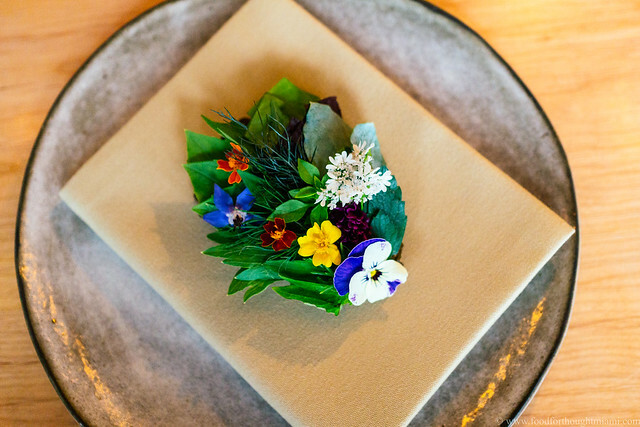 If I told you that a rustic-looking place, with a charcoal grill and wood burning oven, serving food straight from the farms, fields and docks had just opened in the East Bay, you'd probably think it was right on trend. It's a testament to the restaurant's outsize influence; and, I suppose some would say, to the stagnancy of what's come to be known as "California Cuisine." There's a reason for the genre's staying power, though: when it's done right, it's still very good, especially in Northern California, which produces some of the greatest raw ingredients on the planet. And Chez Panisse is still doing it right. 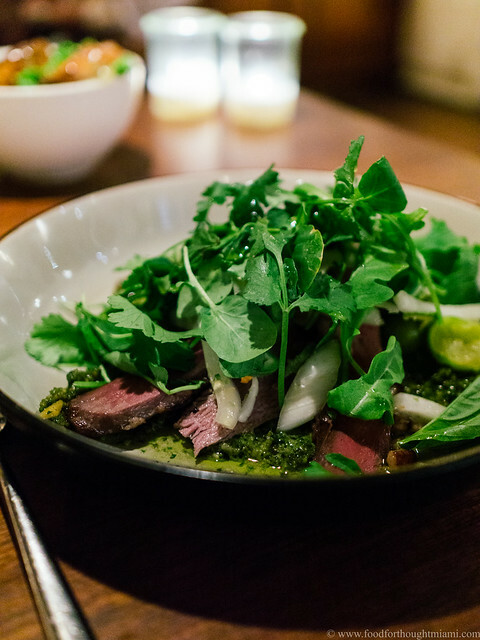 Speaking of "California Cuisine" – Justin Smillie's Upland already made an appearance in Part 1 of this list for a dish he served at our Cobaya dinner. I was back again for more later – more and more frequently. There are several fixtures on the menu there that I crave regularly – the gem lettuce salad topped with ribbons of ricotta salata, the crispy duck wings with yuzu kosho, the wood-fired prawns, the bucatini cacio e pepe – but maybe the best thing I had was a wonderful dish that combined smoked duck breast, still shaded a rosy pink, with green plums, shaved fennel, green almonds, a sort of pesto sauce, and a generous pile of greens and herbs. This is what Smillie does so well at Upland, these dishes that taste like a garden but are still hearty, that look and eat so casual but are executed with refinement and touch. This time last year, I felt out of touch with much of the local dining universe: 2017 was the year of the "to-do list" for me, during which the much-talked-about local openings outpaced even my appetite (or at least my schedule). But 2018 was the year of catching up, at least to some extent. After submitting my list of "Top Restaurant Newcomers" for Eater's annual year in review, I realized that several of them had actually opened late last year. Well, some of us just operate at a different pace. Speaking of pace, the posting schedule here at FFT has undeniably slowed of late. 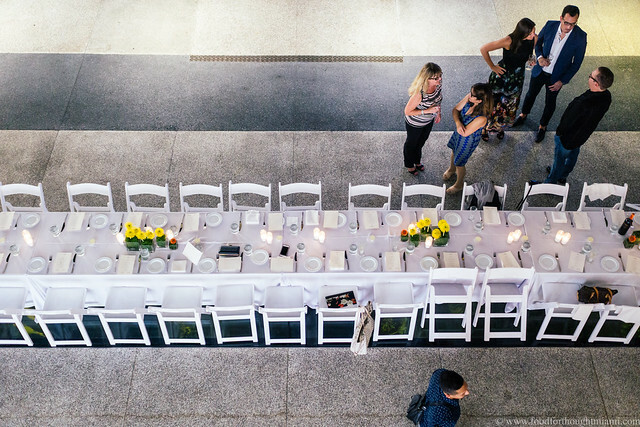 Sometimes a lack of inspiration can be to blame, but that really wasn't the case during a year in which we ate quite well, both here at home in Miami and on visits to New York, L.A., Chicago, the Bay Area, the Pacific Northwest, and Greece. Short trips, often on short notice, meant fewer "trophy" dining opportunities, but still no shortage of good meals. Of the 36 dishes I've put on this list, more than half were served here in South Florida. That's a big difference from years past, when usually only a third or so are locally grown. Unfortunately, several of those are from restaurants that no longer exist. Last year saw the demise of several places that were already fond favorites or rapidly joining that category: Proof, Gaijin by Cake, Shelley's, Wabi Sabi by Shuji. But all is not lost: Justin Flit, the talented chef from Proof, has been doing a pizza pop-up at Taurus in Coconut Grove, and has more things in the works with Ariete's Michael Beltran; Thongsodchareondee Phuket ("Chef Cake") still has the original Cake Thai on Biscayne Boulevard, recently opened a Thai street food stand in the 1-800-LUCKY food hall, and has all sorts of other things in the pipeline; Shelley's chef Cleophus Hethington is working on Ebi Chop Bar, which will focus on the foods of the African diaspora; I'm still crossing my fingers that Shuji Hiyakawa comes back from Japan to reopen Wabi Sabi. Anyway, let's get to the good stuff. 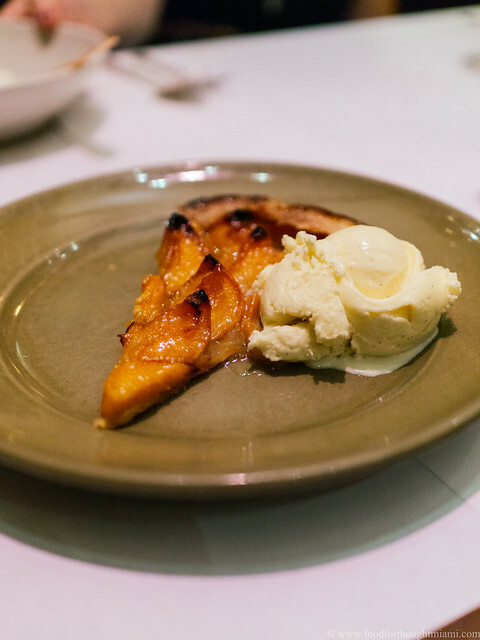 As always, despite the title, there's no pretense here that this list reflects the "best" of anything other than my personal favorites from a year of dining, listed chronologically. 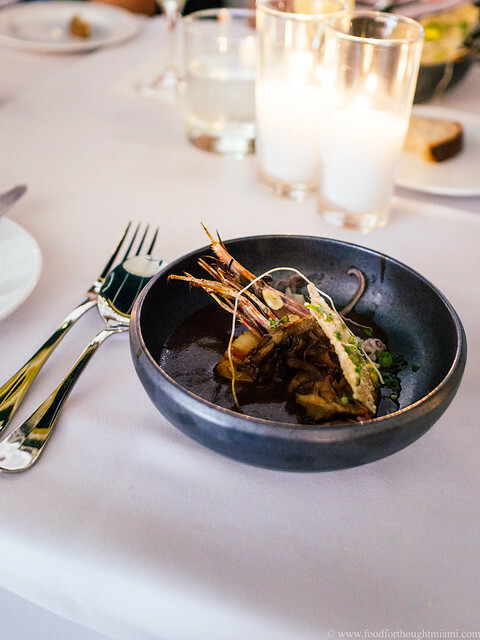 I'd managed to eat Niven Patel's food several times before he'd opened either the first Ghee Indian Kitchen in Dadeland, or its sibling in the Design District, including via a Cobaya dinner he hosted at Rancho Patel last year. But it took me a little while to get to the restaurants. So Ghee – which opened down south a few months after our Cobaya event, and in the Design District in late 2017 – was on my "Top Restaurant Newcomers" list anyway. It's more than just a top newcomer. It's more than just the best Indian restaurant (for my money) in Miami. It's one of Miami's top restaurants, period. 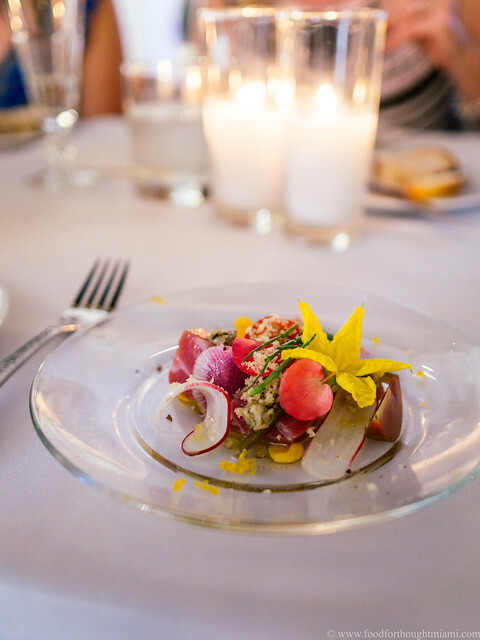 The combination of Indian flavors with a real-deal farm-to-table ethos – the menu highlights an increasing number of items that come straight from the Rancho Patel farm Niven and his family run in Homestead – is on display in pretty much all the dishes. But I have a particular fondness for the chaats: boldly flavored, intriguingly textured, snack-y items like the pani puri, delicate, crispy little cups filled with sprouted moong beans, diced beets into which you spoon a spiced green juice, or the dahi vada, hearty lentil fritters doused with date chutney and yogurt, or the bhel puri bound with mashed avocado and topped with raw tuna. I did not spend nearly enough time in New York this past year. In fact, I was only in the city once, for an overnight business trip. 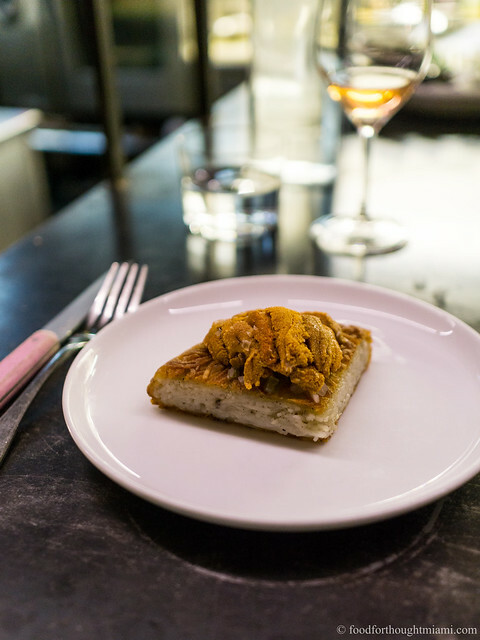 That was enough time to pay my first, very belated, visit to Wildair, Fabian Von Hauske and Jeremiah Stone's delightful Lower East Side wine bar type spot, and to sample a signature dish. It's no wonder the potato darphin can never leave the menu. It starts with the platonic ideal of a McDonald's hash brown or a Channukah latke, depending on your point of reference: hot, crunchy, creamy all at once. That gets brushed with a thin veneer of spicy pickled jalapeño with a hit of citrus (yuzu kosho?). 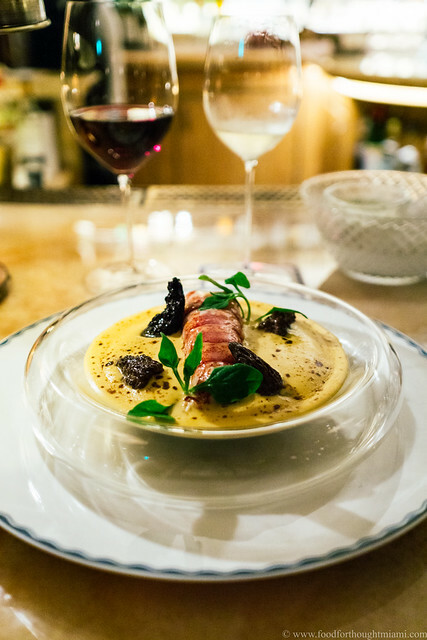 Then it's topped with a generous mound of silky, mildly briny Maine uni, served cold like the winter ocean, for some contrast against the hot potatoes. 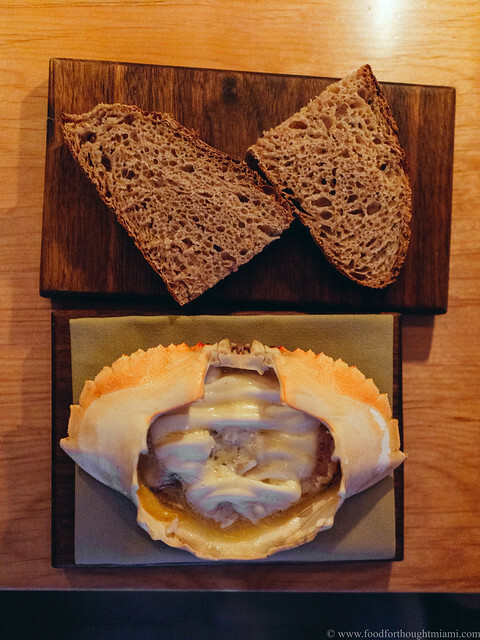 That's a great dish, even better with some funky pet-nat wine to accompany it. Boy, did I ever have a crush on Shelley's. Chef Cleophus Hethington and barman Brian Griffiths were doing something pretty special in, of all places, sleepy South Miami: a quirky, seafood-centric menu, matched up with an equally eccentric selection of pre-batched or frozen cocktails. 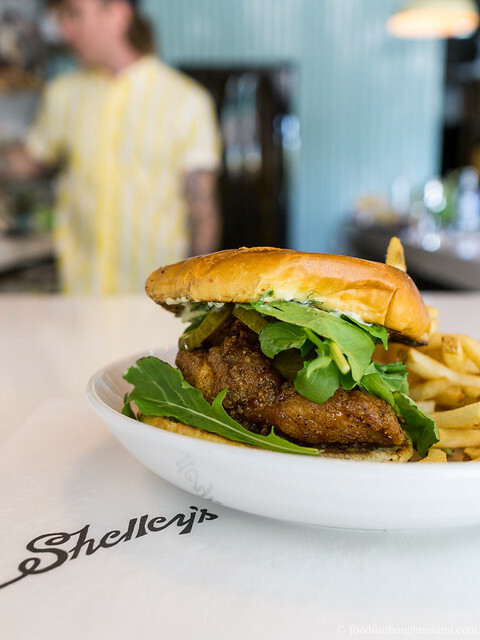 I was completely smitten, particularly by the fried chicken sandwich, which mostly played things straight but then threw a curve-ball with a funky fish sauce caramel. 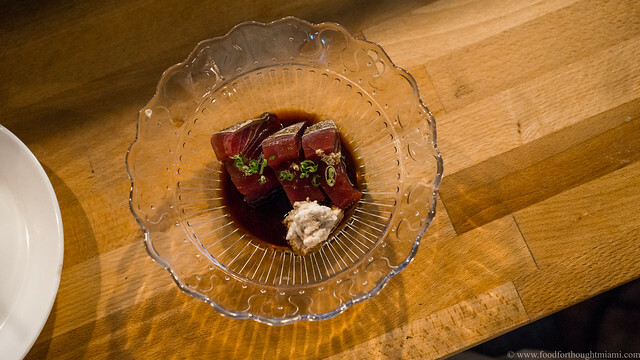 There was a brief, shining moment in time when Gaijin by Cake, Cake's short-lived izakaya in Midtown Miami, had the most interesting sushi bar in Miami. 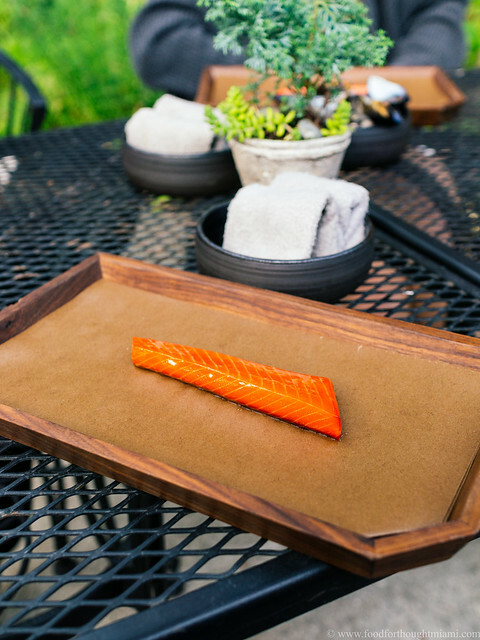 With a big assist from Denni Cha, who is now up in Orlando at a place called Sushi Pop, Cake was running a sushi menu that featured locally sourced fish and aging programs. Miami had never seen anything like this before. You can see the whole lineup from a March omakase dinner here, from which my favorites were a sashimi of local bonito – a fish you rarely see in restaurants because it tends to spoil quickly, but which has the deep meatiness of really good tuna – and a nigiri of local sardine topped with ginger and scallion, a fish that is typically only used for bait here, but which is absolutely delightful when properly cured. 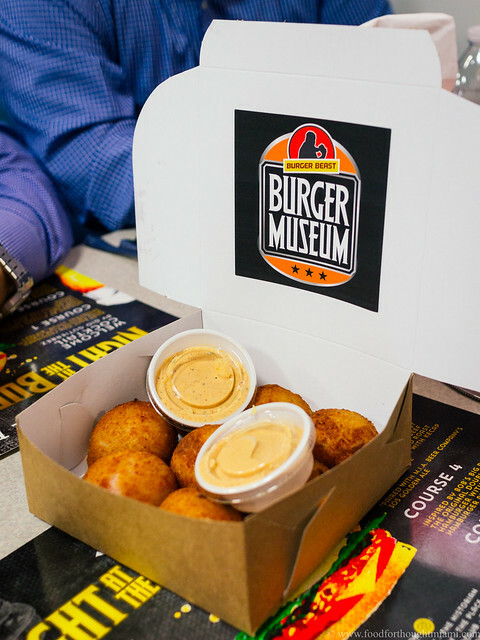 So here was a fun thing: "Night at the Burger Museum," organized and hosted by Burger Beast a/k/a Sef Gonzalez. Most folks know Burger Beast as a passionate and voracious blogger of burgers and other comfort foods, or maybe as the organizer of record setting food truck events. Not as many may appreciate that he is also a true historian of the fast food universe, with an encyclopedic depth of knowledge about the genre and its origins. (He's got a book coming out, "All About the Burger," in a few months). Sef has also compiled quite the collection of artifacts and memorabilia, which was first kept in a warehouse in Westchester I visited a couple years ago. 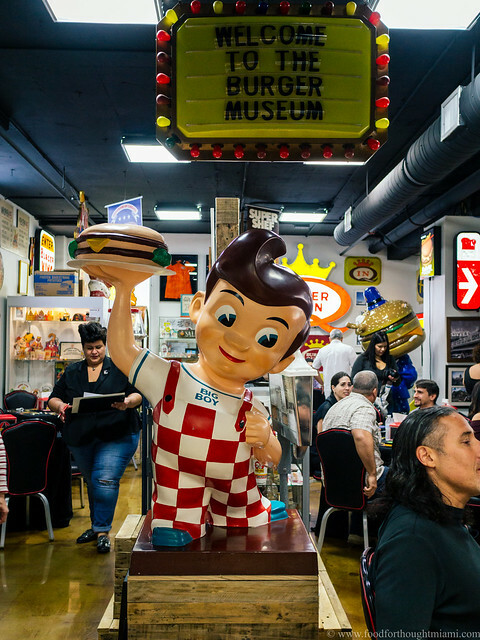 It now has a home at the Burger Museum in Magic City Casino, where you can find Bob’s Big Boy hobnobbing with Officer Big Mac. 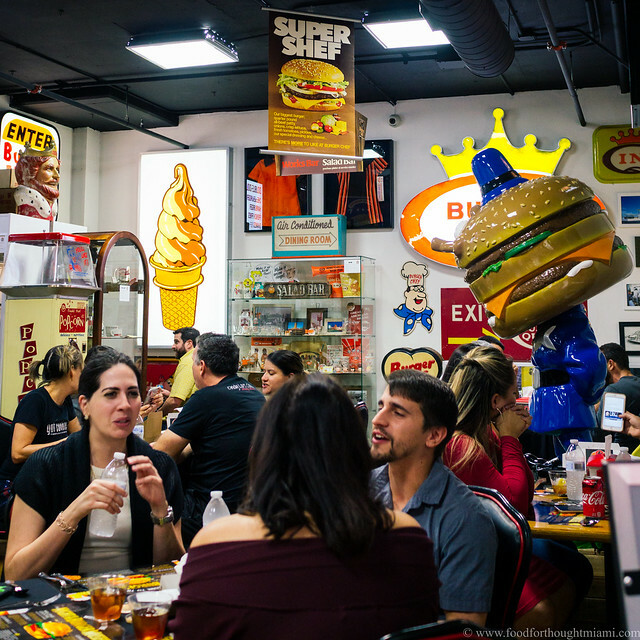 Earlier this week, Sef launched something new there: Night at the Burger Museum, with the space converted into a dining room, and a menu inspired by some of the dishes that were once served at the places whose knick-knacks adorn the walls. (You can see all my pictures in this Night at the Burger Museum flickr set). 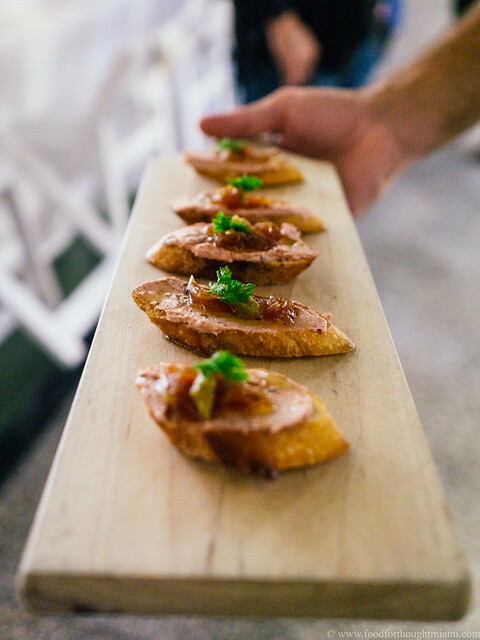 The idea, and some of the original dish suggestions, came from Sef; the re-interpretation and execution were cooked up by Phil Bryant and Veronica Valdivia , who worked together at Norman’s 180, Yardbird and The Local before starting Heirloom Hospitality as a consulting business. 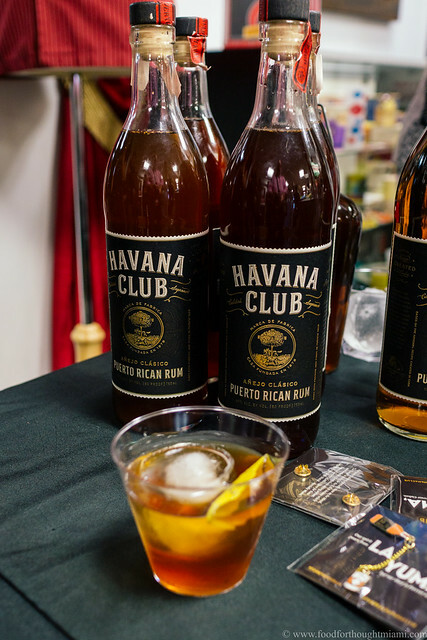 A root beer rum old fashioned, made with Havana Club Clasico rum, sassafras syrup and bitters, courtesy of the always ebullient Gio Gutierrez. Inspired by the Burger King Yumbo Hot Ham and Cheese Sandwich: ham croquetas with a cheese center, served with "special sauce." I'll confess, I was alive for the original Yumbo (which Burger King originally offered from 1968 to 1974, then brought back for a limited time in 2014), but I have no memory of it. This recreation was a feat of engineering, a crispy globe encasing a core of minced ham and molten cheese magma. 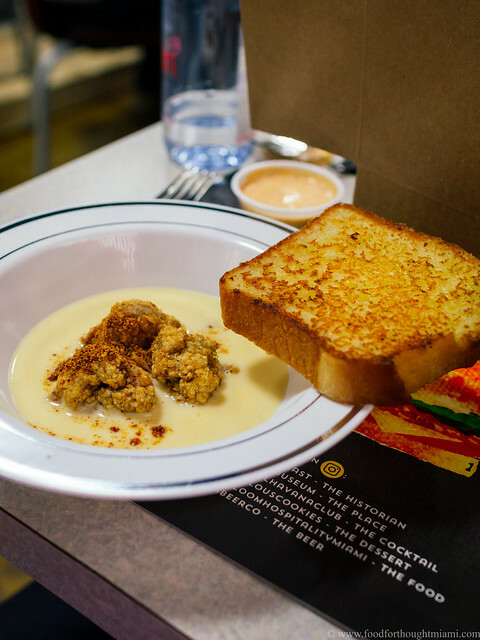 Inspired by the Wendy's Chicken Cordon Bleu Sandwich and Sizzler's Cheese Toast: a chicken cordon bleu soup topped with crispy, spice-flecked chicken nuggets, with a faithfully recreated tranche of cheese-dusted Texas toast riding sidecar. Here's an ad with Dave Thomas hawking the original version, I'm guessing from the early 1990's.